Here's the place- holder for your questions and feednack on Using Maxi-BIAB to Brew a 'Single Batch' Mini-BIAB. Fire at will! Last edited by Ralph on 30 Aug 2010, 19:19, edited 6 times in total. BTW, there's a test afterwards, so pay attention and read it carefully! Just had a good read through your MaxiBIAB guide Ralph. I reckon it's great! I'm impressed that you can get so much beer out of a little pot! I like your logic of not getting hung up on volumes and gravities for the first few brews. From what I have read of your guide, the aim of the first few brews is just to see how much volume you can actually get. This is a very sensible approach. Great pics and everything too. I reckon a lot of brewers are going to appreciate what you have written there mate. Last edited by PistolPatch on 01 Sep 2010, 17:46, edited 5 times in total. The lack of stress over numbers is one big bonus too, selecting the right equipment and process can make for smooth sailing on brewday, but for many new brewers wanting to try full- scale AG without the risk, this should really help. See, you are such an old hand you have forgotten how important figures are to new brewers!!! Old hands know that a few gravity points etc are not that important in getting a brilliant beer but gravity points and volumes are a big concern to most new brewers and this isn't entirely a bad thing - for example, a dodgy thermometer might reveal itself sooner. Just noticed that you might have misinterpreted my, 'the first few,' comment! I, in no way meant that your method is just good for a few brews you silly old bugger . What I meant is that it might take brewers a few brews to work out the maximum volume of beer they can brew with the Maxi-BIAB method! So, rest-assured I meant what I said above that your guide is brilliant. I have no worries about it being a great way of brewing 1000 batches! If the guide (not the method) can be improved though, in any way, I think it only needs some more description of how the method cannot give you exact volume yields until you have done a few brews and that this is not a worry as no method can do it! New brewers are often like I was and crave certainty in their measurements which is quite sensible thinking - new brewers do not have the luxury of experience. Once a brewer has a few brews under their belt they realise how forgiving beers are and have the experience and knowledge of their system/equipment to get things pretty close anyway. I often think about how close brewing is to cooking. One of my sisters is a truly exquisite cook. Anytime I eat at her place I usually can't talk during the meal as the flavours are ten-fold what you will get in the best of restaurants (seriously) - it's often too nice for me to talk. My other six sisters are also brilliant cooks. If I ask them for a recipe though, they say a pinch of this, a scoop of that etc. What I want is exact measurements because I have no experience! So, that is my only criticism of your guide - it may just need some more figures to give more confidence to the virgin brewer? Maybe throw in what figures and volumes you use? For example, when you use the phrase, "3/4 full" perhaps put the volume figure in? I wish my sisters would do this !!! The good news is that after a few trys, I can get close to my sisters' cooking. I have done some guides occasionally on various things and know how hard they are to do. You have done a top job! Last edited by PistolPatch on 01 Sep 2010, 23:00, edited 5 times in total. Sorry PP, was a wilful, cheeky and mischievous misinterpretation on my behalf! You're quite right, the first few will help the brewer zero in on the particular volume, while after a few it could be useful to test a bigger grainbill to explore the upper boundaries. I have actually reduced my regular grainbill to 4.25kg (here), mainly because I have changed my house beer style slightly from ESB to Special/ Best/ Extra Bitter, but also because I was getting too much wort- I was getting batches of 26 L (that's diluted of course) with 4.75kg plus 5-10% of the grainbill as sugar (a must for ESBs) and really don't need the extra wort. BTW, this is getting a bit technical but could be useful, here's a rough chart I was working up a while ago, it shows some MaxiBIAB performance data, however the 6kg grainbill data is not my own. I've not included second sparge data, but it isn't that different to the first sparge, just lower SG. 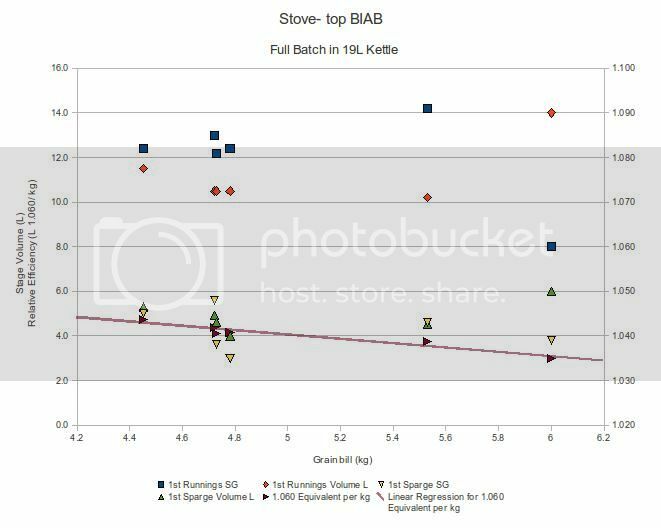 Ignoring the 6kg data (from a different stockpot volume), the first runnings SG increases with grainbill while the volume does the opposite, which is logical- the total mash volume is fixed. Sparge is a little less predictable, but you can see where it is going. However, the maroon series is interesting to say the least, I've normalised it to 1.060 for comparison, it basically integrates all the other series and gives us a relative efficiency as a function of grainbill. So, for 4 to 5.5 kg, it should yield 4 to 5 L of 1.060 per kg. Of 1.060. That's pretty decent efficiency in anyone's books, but only a convenient by- product as it isn't what I wanted when I started doing this! I hope to add all my data to this chart, but as it is it demonstrates typical MaxiBIAB figures using the method I've described in the guide. I'd also like to do the conventional 'into the fermenter' efficiency, but with this method it is a fixed loss of wort to trub, generally a litre or so. Last edited by Ralph on 02 Sep 2010, 07:26, edited 5 times in total. I have a 40 L urn and am currently enjoying doing a few smaller batches just to try out different tastes etc, but once I get a few good house beer recipes sorted I'll definately take inspiration from your MaxiBiab to do a double batch or two as I'm often strapped for time. Yeah, there's no reason why novice* brewers can't get into AG, the equipment is available cheaply in most shopping centres, it produces full- sized batches and is reasonably simple. Even if they don't like it (and that could be the case for a number of reasons- taste/ flavour, effort, time), it isn't such a big risk to try AG out, whereas other systems will cost a bomb and if it isn't what the brewer wanted, then there's all this now- useless equipment left over. Stick it to your brother, I have one in the exact same boat too! He's getting a reprieve at the moment, lucky beggar is in France for a conference, but when he gets back, I'm sinking the boot in. The 40L urn is pretty darned close to double the MaxiBIAB, if you want to scale it up I'd suggest something to assist with lifting the bag (pulley/ cleat/ eye etc.) and also use a 20L bucket for sparging. Hope it works out, let us know how that goes! * By novice, I mean anyone brewing kits already, so the fermentation and handling side of things are already sorted. So if I am right you dont do a mash out at the end of the mash, but you sparge twice with boiling water or hotter than mash water to essentially do a mash out at the same time as a sparge? You mentioned 'really hot' for the first sparge and then just 'hot' water for the second. Roughly what temp are you sparging at for each one, and for how long? Guessing 77 degrees C would be a good temp to use so you sparge and mash out at the same time. Also you mention after the second sparge not to squeeze the bag out too much as you will dunk sparge, but there is no description or further mention of the dunk sparge. How is that done? Thanks for any further info you add to the guide for newbies like me. Before I read about maxibiag I was already thinking about doing separate sparges/mashes in a bucket and at different temps to the mash for a sudo 'multi reset mash', or would this not work if you need the enzymes from the mash in with each higher temp sparge? Hi Skinah, thanks for that! Good points, with water temp I just use water slightly off the boil, so a freshly- boiled kettle left to rest for a moment. By the time you add 3L or 4L to a bucket and drop the bag in, the water temp drops to about mid- high 80s (for the unit converter: 85C to 90C), adding the bag of grain at around 60C only lifts the overall temp to around 70C, then doing it again gets you to around mashout temp of 75C. There's lots of heat losses as the bucket is usually uninsulated plus it is not a big heat reservoir to begin with so cools down fairly quickly. BTW, mildly acidifying the sparge water with a pinch of citric acid is helpful, all up I'd use about 1/2 to 1tsp over the 8L of sparge, but my source water is slightly alkaline. Not sure I understand your question about dunk sparging, post 4 covers the sparging, this is the dunk sparge which we do twice. The asterisk (*) is a footnote to the very first sentence in that section, maybe I need to rephrase the text, it is a bit ambiguous, or at least move the footnote. With step mashing, much of the enzymatic activity actually takes place in the liquid and as far as I understand the process, it is important to progress all of the liquid through all of the steps with rests at particular temps. I could stand corrected though on this though, I'm no mash chemistry expert. FWIW, I have done stepped stovetop BIAB mashes with decoction a bit, it is actually quite simple (I use the aluminium stockpot full of grain in the Equipment pic), but I'll only do it for lagers and I'm just not big on lagers ATM. Hope this helps, good luck with it! Last edited by Ralph on 05 Sep 2010, 09:20, edited 5 times in total. Thanks for the replies, that answers everything for me. The footnote was throwing me off since it was after the second sparge, did not relise it was a footnote for the first sparge and now it makes sense. If it was moved up above the second sparge description I would not have read it wrongly. Must have missed the * meaning.. Since I am using an URN, I will use my two retired SS stock pots to heat the sparge water on the stove and will not have the same heat losses that your plastic bucket will have. I will try to aim for the first sparge to be past mid way between the mash temp and 75, and then the last sparge to be around 75 (mash out temp). No worries Skinah, I'll see if we can't tidy that up the guide, thanks for your proofreading- you've passed the exam! Those temps sound OK to me, one other thing I should've mentioned is that one other event that takes place with mashout is the higher temperature denatures most of the enzymes, thereby halting conversion. With BIAB this is not so much of an issue and most will skip it, but if a sparge is slow (a double sparge can indeed have hiccups) and mashout temperature isn't reached then enzymes can continue to process starches, albeit at low concentrations because most of them have been drained away in the first runnings. With high diastase malts that may still be yielding enzymes this could be a problem at least hypothetically, in reality though, I think this just isn't an issue. I invariably mash low (64C) and long (often 120 minutes) for my preferred drier beers, the odd batch with some unexpected residual sweetness or higher FG (very uncommon) has me wondering if mashout was just a brief mashing at a higher temp. Cannot wait to get a house APA and a house Kolsch down pat so I can do some double batches using this guide!! Thanks! Ralph wrote: there's really not much you can't achieve with the trusty stockpot, it is seriously underrated by many brewers! I've been figuring this out as I've experimented with all-grain. A friend of mine taught me his method for brewing all-grain in a stockpot, which was pretty inefficient but we just added extract and it worked. Later he got fed up with it and built a mash tun. For my latest beer, I was heating the water when I decided to look through How to Brew again, to see if I could figure out how to get better efficiency. So I figured out that the problem was we'd been putting the grainbags in a spaghetti strainer over the brewpot and pouring boiling water over it, and calling that a sparge. So I decided to try to improvise something that would actually be a sparge. I ended up using 9lb grain in 4 gallons water without a grain bag (which is convenient on a gas stove, since I didn't need to worry about the bag melting, just needed to stir a lot), ran through the 3 rests that Palmer recommended, and after mashout I fished the grain out with a smaller spaghetti strainer, and sparged it in 2 big metal bowls. Turned out pretty well. Now I'm trying to decide if I need a 10 gallon pot or not. Last edited by AltoidAddict on 21 Oct 2010, 13:40, edited 5 times in total. Hi AA, thanks for the info and sharing your experiences! One of the main objectives with this MaxiBIAB method has been to adapt MiniBIAB to larger all- grain batches, i.e. 23L which just about everyone seems to consider standard here in Australia, but without any extract. We know MiniBIAB is a great All- Grain trial for novice brewers, it works brilliantly for smaller batches. It is basically a stovetop- scaled, low- risk with common and cheap equipment version of the very original BIAB concept which is no- sparge/ full volume. However, often folks are unhappy with the brewlength (I know I was!) but then after a bit of thinking of my own and some guidance from clever guys such as PistolPatch and Beachbum, it was adapted to the >23L MaxiBIAB variant. It still stays within the original stovetop parameters though, so it can still be a low- risk AG tester method for novices, uses cheap and readily- available equipment while the quality remains uncompromised. The 1970's Dave Line method (I think there's others too) of mashing in a tun then running the mash through the grainbag to lauter and then sparging in it is similar, but the modern BIAB concept of actually mashing and lautering in the bag with the full volume in the mash tun/ kettle does away with most of the equipment and operations of 3V brewing, that's the really revolutionary aspect of BIAB. I guess if you are needing to decide about the 10 gal pot, perhaps consider that MaxiBIAB does 25L in a 19L pot, if you can scale it up in your existing pot, then the answer would be no, you don't! Last edited by Ralph on 21 Oct 2010, 19:00, edited 5 times in total. but i'm trying to calculate how to hit the gravity numbers I want when i'm finished the brew, to use post boil dilution, giving enough to fill 2 cubes with a target-gravity wort. or hit a 44L batch etc. For this formula a Specific Gravity such as 1.055 is expressed as 55. Required Amount of Water = Diluted Volume – Actual Volume"
my question is: What is the post-boil concentration? Also - Ive got a great idea for an addition to the Calculator spreadsheet, but my brain doesnt work in those ways, so it may be of use to the creator to add. Or suggest how I can add this for my own purposes. Last edited by jestersdarts on 28 Oct 2010, 12:14, edited 5 times in total. I have thought about this all afternoon - and I think I have answered this myself. This formula is derived from the old hotdog V1 * C1 = V2 * C2. and have the spreadsheet calculate the volume of dilution water you need AFTER the boil to hit your target gravity & volume. Got it in one JD, well done! Post- boil concentration is called that to differentiate it from Original Gravity, which it is not as it is about to be diluted, with the concentration being adjusted to the OG. Because there's a fixed mass of sugar, doubling the volume will result in half the concentration, so it is just a simple linear relationship. Post it up if you can JD. From what I have read, you are definitely on the right track. The dilution amount would have to be slightly adjusted due to non-evaporation (this bit isn't getting boiled) but this is not a big deal. I can't think of any other worries so please post your version for us. Last edited by PistolPatch on 28 Oct 2010, 22:50, edited 5 times in total. Firstly thankyou to the creator of this spreadsheet – I take no credit for it, I’ve only mucked it around to suit my own needs. What I’ve tried to do is track back the water volumes required for my system, to try and find how far I can push my set up, and “max it out”. You can fiddle with the variable numbers, and see what works for your system. I’ve based this around my method, of my 40L URN which I use for the mash tun, and transfer to a 45L Kettle for boiling. (If the urn is used for the boil, you can just count both vessel volumes the same). The sample data is for a final 43L “into cube“ volume (enough to fill 2 cubes with a 1048 wort) and it shows the breakdown of volumes and gravities at each point in the process (so I can see what I am meant to be hitting). The system really only works to show you “top up” volumes at various stages in the brew day, and give you the gravities at each step, but what this allows you to do is keep more accurate measurements, know what you should be hitting, and hopefully see how far you can push your system. Oh and how much grain you should be using. Red Text:	Recipe Targets. i.e desired volumes, and desired gravity. This spreadsheet (and hence its purpose for me) works using Maximum mash volumes (potentially 40L from urn), and maximum boil volumes, because we want final volumes that are greater than our systems total volume. So I figure have these as full as possible at most times, and top up as required. I understand you can just do this all at the end, or top up with any old amount and so on, but it helps me walk through, and plan my brew days ahead of time. I hope this has added useful information for you babbers out there, and not just more useless information! Feel free to add criticism, or if I am missing something all together! I haven’t mucked around with the other pages, so I don’t know if what I have changed on this spreadsheet has upset them. I’m happy I’ve nutted this out, I feel comfortable about doing double batches, and hitting the numbers I want along the way. not the old one! my apologies for intern00b-ness!! Last edited by jestersdarts on 29 Oct 2010, 11:37, edited 8 times in total. Good work JD, I have been thinking it would be good to incorperate Ralphs work into the spreadsheet. I am also going to start giving double batches a go in my 50 L keggle. Hopefully Biabrewer or someone else for that matter can get some time just to refine the extra work you have done to accomadate most brewers in their situations. Again top stuff, Its good to see people putting some effort in to benefit all brewers. I apologise- this isn't the version I was meant to post! It's at work!! Arrgghhh sorry babbers for my forum incompetence.. I will have to post the version one Monday comes and I'm back at work!! Once again my apologies... I will try to edit original post. What a way to ruin a post!! Last edited by jestersdarts on 29 Oct 2010, 14:48, edited 5 times in total. Thanks JD, I'll have a close look at this tonight, but I'm sure its good stuff! OK managed a 48L batch out yesterday, using this spreadsheet to help me along the way.. worked out well, gave me the dilutions that I needed at each step, and came in at 48Litres of 1.042 into cubes. required 1.043 from recipe. I'm pretty happy about that! Still not 100% on my evaporation rate (I think its less than planned), and underestimated the amount of trub left in kettle, but for my 3rd AG, I cant complain. So easy, I rekon i'll always try double batches from now on.. Even if you have a single batch small fermenter, if you cube, you can give one to a mate.